Patricia (“Pat”) Ann Haley, SCN, 73, was born in Columbus, GA. She died on Tuesday, November 27, 2018 at Nazareth, KY. She was a professed Sister of Charity of Nazareth for 52 years. 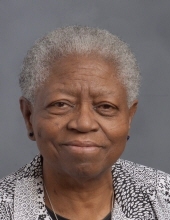 In September 1963, Sister Pat entered the novitiate of the Sisters of Charity of Nazareth as the Congregation’s first African American postulant and was the first African American Sister to serve in the Archdiocese of Louisville. She is a founding member of the National Black Sisters’ Conference. She continued to be a vital and inspirational member of the Conference until her death, attending the 50 year anniversary celebration in New Orleans this past August. Sister Pat served in educational ministries as an elementary school teacher at St. Ladislas in Columbus, OH and in Louisville at Immaculate Heart of Mary and St. Thomas-St. Vincent. From 1970-1981 Sister Pat served in parish ministry at St. Benedict Church in Louisville. She spent eighteen years in ministry in Philadelphia, PA serving the Mariyama Vocation Center and as coordinator of the Spiritual Enrichment Program for the Institute of Black Catholic Studies at Xavier University of New Orleans. She also served for many years in pastoral/social ministry in St. Petersburgh, FL before returning to Nazareth, KY in 2011. Throughout her 52 years as a Sister of Charity of Nazareth, she attended especially to the African American community, serving with her gift of spirit, her dynamism and her gift of song. Sister Pat is survived by her sister, Gladys McGee of Birmingham, AL, her extended family, and by her religious community. Wake will be held on Tuesday, December 4 at 6:30 p.m. at St. Vincent Church in Nazareth, KY. The Mass of Resurrection will be celebrated Wednesday, December 5 at 10:30 a.m. at St. Vincent de Paul Church, Nazareth, KY. Burial will be in Nazareth Cemetery. Funeral Arrangements are being handled by Houghlin-Greenwell Funeral Home 1475 New Shepherdsville Road, Bardstown, KY 40004. Memorials may be offered to Office of Mission Advancement, P.O. Box 9, Nazareth, KY, 40048. To send flowers or a remembrance gift to the family of Patricia "Pat" Ann Haley, SCN, please visit our Tribute Store. "Email Address" would like to share the life celebration of Patricia "Pat" Ann Haley, SCN. Click on the "link" to go to share a favorite memory or leave a condolence message for the family.